Another week has come and gone... We will also be turning another calendar page tomorrow. Sweet November, month non-grata here he comes! Just enough time to take a breath, before Christmas! 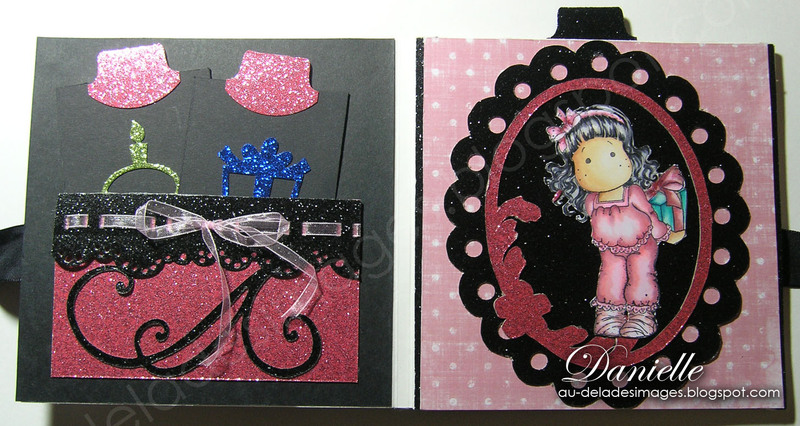 For this week's challenge at Stamptacular, Hide and Seek is the theme! So, I have decided to create this slider card, hide the sentiment, and a few other suprises. Well, constructing the card it-self caused me a few headaches! I had to start all over, wrong ajustments! No other Tilda was best than Longing Tilda at her castle window to introduce a surprise. Who knows what or who this little sweetie is thinking about... I colored my images with Copics, and embossed the castle window to give it a shiny look. Behind Tilda, I have used an acetate inked with Rangers Alcohol Inks. All the DP's are from the wonderful Tim Holtz idea-ology paper stash, Vintage Shabby. Aren't they gorgeous? (Rest assured, Christina, I have had this pad since September! and was waiting for the perfect time to use it). On the front of my card I used the grey color. I made my flower with the Magnolia Peony Petals doo hickey, the pink cardstock is distressed with a few coats of Distess inks, in tattered rose, fired brick and aged mahogany. The leaves are from the Magnolia Doo Hickey Leaf and Swirl die cut. The rhinestones and ribbon are from my stash, and I used the Tilda Lace die to created the border. On the inside cover, I have created a little pocket with two tags; I used again the Tilda Lace and the tag puch from SU. To decorate the tags, I added birthday stickers. On the other inside page, I cut a scalloped oval and decorative piece from the Cricut Lacy labels cartrige. I stampted Sneaky Tilda and showcased her in this pink and black decor. Have you noticed the little tag at the top of the page, well, if you pull on it, two slide pannels will come out! This is where I had problems... On the top one, I have cut the sentiment with my Quickutz alphabet and decorated the page with the Magnolia doohickey Leaf and Swirl die cut. The bottom one is reserved to writing, so I distressed a piece of pink cardstock, decorated with a cuttlebug die and the Magnolia swirl and lace, all over a black cardstock. these thickneses give a bit of a problem, because they don't make the slide as smooth as it should. You have until midnight November 6, to submit your Hide and Seek project at Stamptacular Sunday Challenge. Our Sponsor this week is Robyn's Fetish and the prize is a choice of 5 digital products and our very own Dee prize. Looking forward to see what you are going to create! Nous voici déjà à la fin du mois d'octobre; novembre, ce mois mal aimé, frappe à notre porte, juste le temps de souffler un peu avant la frénésie des fêtes. Notre défi à Stamptacular, porte sur les cachettes, Hide and Seek! Approprié pour ce dimanche d'Halloween. C'est plutôt une carte d'anniversaire que j'ai choisi de créer. 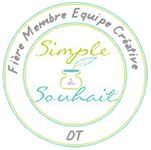 En fin de semaine dernière, j'étais avec un groupe de copines pour faire du scrabooking; et Brigitte, qui anime des ateliers de scrap, avait réalisé un mini album, plein de cachettes; c'est ce qui m'a inspirée à créer une carte à partir de la première section. Il m'a fallu une partie de l'avant midi pour trouver le bon format et me faire un modèle. Que j'ai dû recommencer quelques fois avant que tout glisse rondement! C'était sans compter le fait que j'ai ajouté des découpes soulevées, ce qui bloque un peu... mais bon, rien n'est parfait! J'ai coloré Longing Tilda et la fenêtre de son château pour le dessus de ma carte, je l'ai décoré avec la dentelle coupée au moyen de la découpe Magnolia, ainsi qu'avec une fleur faite main, encrée aux distress et vaporisée avec du glimmer mist. L'alphabet est une découpe Quickutz. Le verso de la couverture est un petit panier contenant 2 étiquettes, conçues avec le poinçon SU; la page suivante est une découpe de la cassette Lacy Labels de Cricut, dans laquelle j'ai insérée Snicky Tilda - que j,adore colorier. Vous avez remarquer la petite étiquette noire au dessus? En la tirant, on découvre les 2 panneaux dissimulés. Les souhaits sont inscrits sur celui du haut, et j,ai laissé un petit espace blanc permettant d'y écrire des voeux personnels. Il y a beaucoup de travail, quelques petites erreurs, mais je suis tellement contente du résultat. J,aimerais aussi vous remercier de venir me visiter et de me laisser de si gentils commentaires. C'est un rayon de soleil dans ma journée! Le défi de Stamptacular se prolonge jusqu'au 6 novembre, venez participer en grand nombre, et peut-être gagner 5 étampes digitales de notre commenditaire: Robyn's Fetish et un prix d'une des membres de notre équipe, Dee. oh! Wow! Elle est magnifique cette carte! Il y a beaucoup de travail là-dedans! Ta fleur est magnifique!J'aime beaucoup ta colorisation et ces 2 jolies étampes! Tout est parfait!!! Merci pour tes commentaires, ils nous font toujours plaisir!!! I feel like I haven't been sharing the love Danielle with such a busy schedule but I have been lurking! Your work is always beautiful and inspiring. I love the Pink and Black. Wonderful card!! 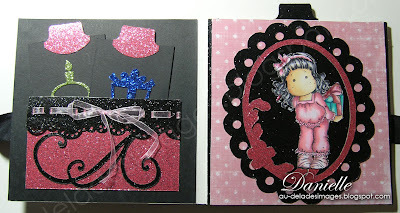 Oh my goodness, I can see that you put a lot of work into this card....it is a labor of love for sure! 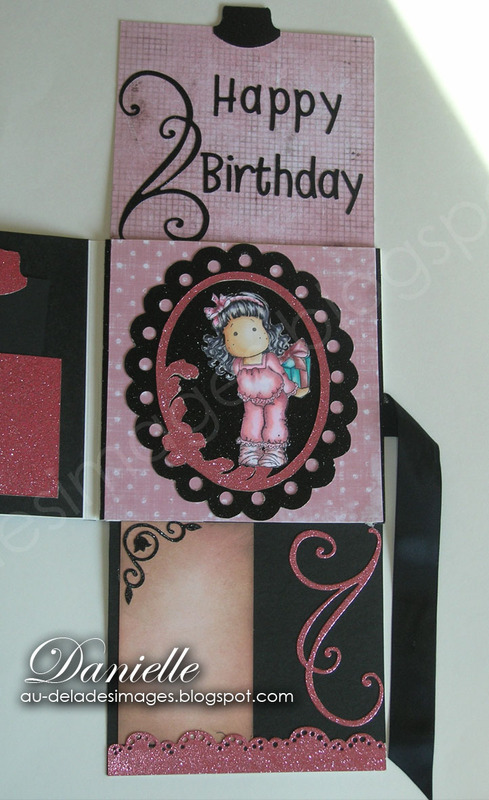 The inside of this card is as gorgeous as the outside and all those wonderful little surprises....WOW!!!! 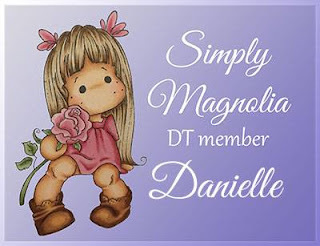 Both of those images are colored to perfection, Danielle....magnificent job!! This color combination is my favorite. Love the papers......I happen to have that collection as well. Absolutely STUNNING!!!! Je suis capable de m'imaginer tout le travail que cela a nécessité! OMG Danielle this is just so pretty ! What a piece of art you have created ! Beautiful papers and love all the goodies too. That's just lovely, Danielle, and so much work! Beautiful card. Beautiful, Danielle! Love your coloring on your Tilda's. Danielle - This is just darling! The card design is so interesting. Great coloring. Love all the details. Beautiful Tilda coloring Danielle! love the scene on the front! Danielle, I love this! I love the idea and your coloring is wonderful! It is such a fun card! The hidden tag/message is so clever! What a great card! Every where you look there is something really cool to look at! Great job! What a beautiful card. Love all the ways it opens. Danielle, What a lot of work and careful planning for the construction to make it all come together -- great job - I love it! Your colouring is superb. Wow, it looks like a difficult card to make! It came together nicely though. I love the peony flower and the two beautiful Tildas you colored! TFS!! What a great project and so beautifully done Danielle! Love all the folds and pockets! Fantastic job!!! il y a beaucoup de travail dans cette carte!! Beautiful card Danielle. Love how you made it. WOW, this is so gorgeous! Love your coloring and I love the tags. Une carte vraiment sansass!!! Tu es une pro de la colorisation! BRAVO! Ooh, Danielle, what a fabulous project. And all those hidden little treasure. I love it. I can see also what a lot of work you’ve put into this. It was worth it. Love the colour scheme you’ve chosen. Beautiful colouring work. Love your die cuts especially the swirly one. You did a terrific job of putting this together. Je le savais que tu ferais qqc de fantastique avec cela. L'idée est génial comme tu dis si bien. Du noir, tu as de l'audace pis du gots. Wow! I've never seen a card like this before. I'm so impressed! Love all the extra places for wording and tags.